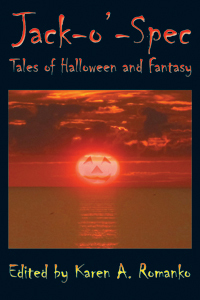 Jack-o'-Spec: Tales of Halloween and Fantasy is a planned paperback anthology of speculative short stories, flash fiction, and poetry about Halloween and the traditions and legends surrounding it. Jack-o'-Spec will feature the many faces of science fiction, fantasy, and horror Halloweens: steampunk Halloweens, post-apocalyptic Halloweens, alternate history Halloweens, outer space Halloweens, and noir Halloweens, not to mention new speculative takes on Halloween perennials, such as haunted houses, witches, ghosts, vampires, and, of course, jack-o'-lanterns. 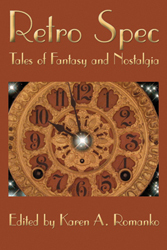 Edited by Karen A. Romanko, Jack-o'-Spec will be published by Raven Electrick Ink, publisher of Retro Spec: Tales of Fantasy and Nostalgia, Cinema Spec: Tales of Hollywood and Fantasy and Sporty Spec: Games of the Fantastic. The anthology is scheduled for release in September 2011.